Terry Charleston II is a native of Dallas, Texas. He graduated from West Mesquite High School in 2012. Terry was recognized for his academic achievements in High School and became the recipient of a full scholarship to the University of Texas in Denton. He continues to chart his path and excel in achieving his goals. AMPS: AMPS Magazine is very interested in our future leaders. We utilize our platform to spotlight the accomplishments and successes of these young exceptional individuals. Four years ago, I interviewed you as you were preparing for High School graduation. During this time, you were awarded a full scholarship to the University of Texas. What was the criterion of your scholarship? 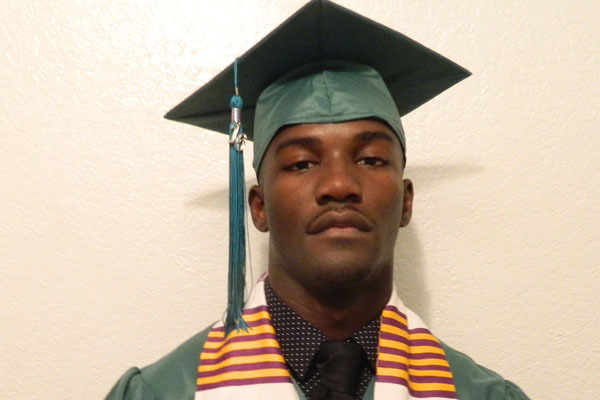 Terry: I received a full scholarship for being in the top 5% of my graduating class. AMPS: What is your area of study? Terry: I enrolled as a Biology major. After my sophomore year, I changed my major to Criminal justice. I was having some challenges within the program and decided Criminal Justice would be a better career choice for me. AMPS: Biology and Criminal Justice are loosely related areas of study. What prompted you to make this transition? Terry: I have always wanted to work with people within my community and I have a particular interest in Law Enforcement. AMPS: I know that you are enlisted in the Reserves. What branch of the military reserve do you serve? AMPS: Why did the Army interest you more than other military branches of the reserves? Terry: My interest in the Army Reserve was partly traditional because of my grandfather. He served four years in the United States Army. I have always admired him for his service to our country and I wanted to do the same. I also felt that servicing my country in any capacity would go hand in hand with a Criminal Justice career. AMPS: You seem to have a strategy in place to get to the next milestone. What is next for this future leader? Terry: Things are going great so far. I came to the University of Texas as an Infantryman. I joined the ROTC Program and now I am a 2nd Lieutenant. I am one of three African American students who are on scholarship out of sixty-five cadets. AMPS: What are your plans after graduation? Terry: I will fulfill my duties with the Army as I pursue a career in Law Enforcement. I currently have an internship with the Office of Inspector General. I will either stay with this agency or pursue employment with the FBI (Federal Bureau of Investigation), EDA (Economic Development Administration), ATF (Alcohol, Tobacco and Firearms) or the Secret Service. AMPS: What advice would you give your peers? Terry: Especially to the young African American population, I would like to say: “Set realistic goals but reach for the stars”. Look for ways to advance your education. Education should always be a priority. Stay determined in reaching those goals. Develop skills that will separate you from the competition. Lastly, I would say to never let disappointments or challenges determine your destiny. Regroup and keep moving forward. AMPS: AMPS Magazine salutes you Lieutenant Terry Charleston. I know that you will continue to “Be All That You Can Be”. We are so very proud of you. Stay “Army Strong”! Thank you for your service.